Have you ever wondered what are the top 3 IIS based Wiki Applications, well here is my list not sure if it will be you top 3 but this is mine. So what are my criteria? It should be free, you can easily modify it (opensource), the backend database should be SQL Server and it should be Microsoft Based Application which means it should run in IIS. So what is my top 3 then. The most popular .Net Open Source CMS is my third in the list. And eventhough it is a CMS application it has as Wiki Module, though not extensive as the open source wiki’s it does it job. To give you an idea here are the main things that you can only do. 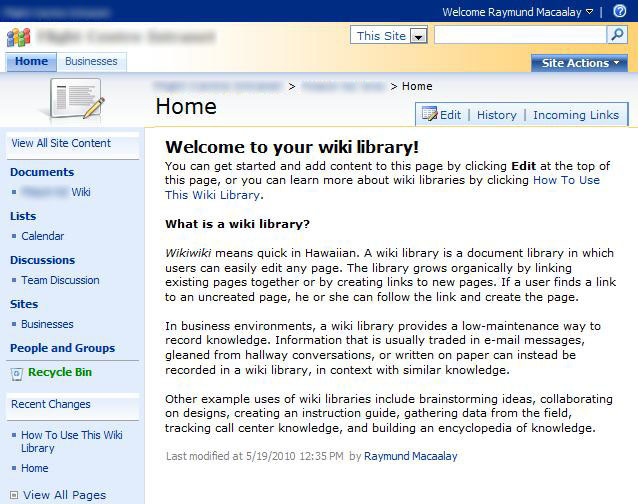 Home – Brings you to the default page of the Wiki, not the default page of the site. Search – Searches the Wiki. Recent Changes – Review the history of changes. Index – Some sort of a table of contents where it shows you all Wiki Pages. Add – Adds a new wiki page. Edit – Edits a wiki page. View Topic History – Review the history of changes on the specific Wiki Page. Use DotNetNuke Security for edit content permissions – As it says use DNN Security otherwise you can manually override the permissions. Allow Pages Ratings – Allows the visitor to rank the page (individually or globally). And thats about it, thats all you can do. I’m not saying that its not good but DNN’s main focus is CMS not a Wiki. The wiki part is just a bonus. DNN can be freely downloaded here. Open Source which means you can customize whatever you want. Can do more than just a Wiki site. Can easily port to the internet. Need a bit of learning if you want to customize stuff. Not a full blown wiki application. Yes, youve seen it right its Sharepoint and its another CMS Application. Eventhough Sharepoint is a content management system it can be utilized as a Wiki tool and it comes free with a Windows Server which you can download here. Integrated natively with Active Directory. Performance is based on the Server Hardware. You need to use Microsoft Sharepoint Designer to customize. Making it available on the Internet it not simple. And the number one is ScrewTurn Wiki! Gotta agree. 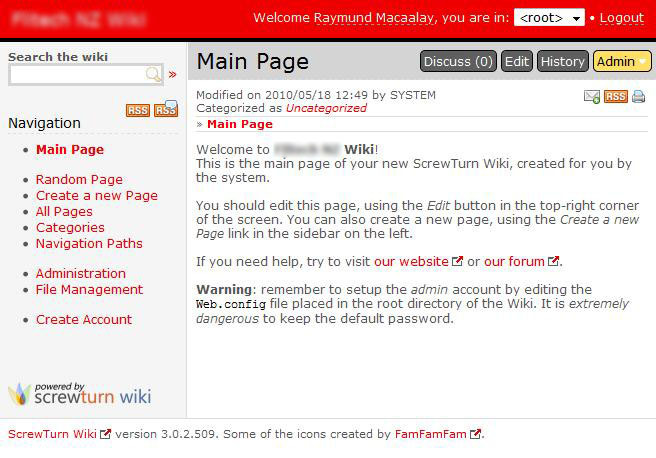 I set up a ScrewTurn wiki for the company I work for and it’s extremely easy to set up and use. Love ScrewTurn wiki. Started using it in our company several months ago. Sharepoint now being introduced. I was so underwhelmed that we will keep the wiki in ScrewTurn and use SP for its other features. Hate to rain down bad news. As good as Screwturn is, it has stopped production. They are currently attempting to locate developers that would be interested in taking over, but so far I have not seen enough people step up.